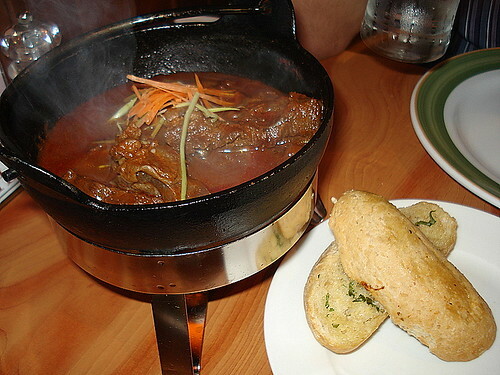 Hungarian Goulash Stew with Garlic Bread, originally uploaded by Camemberu. A few people on the Makansutra forum recommended this place at Siglap - Stewhaus International (next to Sushi Jiro). It's a really cosy and family-friendly joint, everyone there brought their kids. We tried the Hungarian Ghoulash (S$14.80) which came in a little black iron pot kept warm and bubbling by a temporary fire (dang my pregnancy amnesia, I forget what that's called). Hubby liked the flavourful tomato-ey stew but not the beef. He thought they were too fatty; I thought they tasted like gelatin. 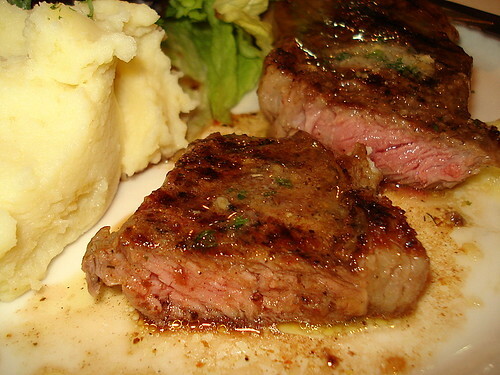 NZ Sirloin Steak with Herb Butter, originally uploaded by Camemberu. 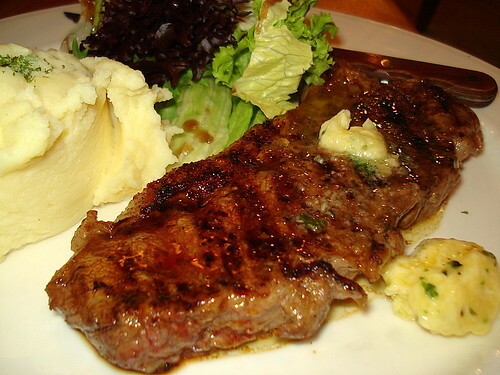 The NZ Sirloin Steak (S$14.50) was not too bad. You get a choice of carbs (pasta, bread, mash, rice, etc) and sauce/seasoning (we chose herb butter). Yummy, originally uploaded by Camemberu. We had ours medium well. Nicely charred on the outside, tender on the inside. Oh the mash is incredibly soft (almost like foam!) but a bit bland. 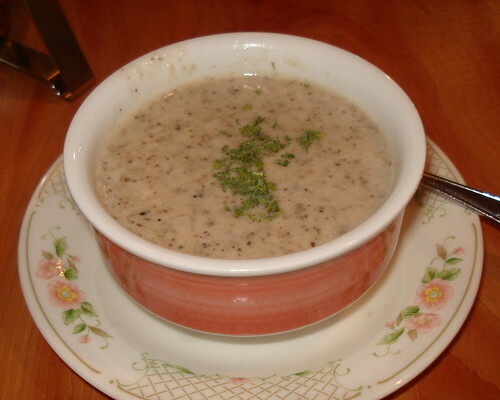 Wood Mushroom Soup, originally uploaded by Camemberu. Oh we also had the mushroom soup (S$3.80) as a starter. Thick, creamy with lots of tiny mushroom bits but nothing spectacular. Needed a dash of salt to tone down the tinge of sourness. Yes, this place tends to be use salt sparingly in its dishes. That could be good for those with hypertension but some of the food may come across a little bland - Well, better bland than overly salty. You can easily correct bland. We overheard a lady at another table complaining that her food was not salty enough, and her hubby beckoned her to the salt shaker. All in all, not a bad place to come for a family dinner or lunch (set lunches go for S$9.80). Reasonably affordable too, none of the mains are over $20 and there is no GST or cess (just the 10% service charge). Oooh thanks for posting this - always on the lookout for affordable joints like this.